This campaign is set ten years after a previous set of adventures (HERE). This is the Twelfth full session of the current campaign (Session XI can be found HERE). Last session, Min and Lingsu traveled to the village of Buak in search of a child prophesied to be the reincarnation of General Dou Lun. According to legend the child would defeat the current emperor and reclaim the throne for Hai'an. They followed the trial from Buak to the Village of Bao where they met the child, a girl named Water Lily. Her guardian and Sifu, White Qirin entrusted her to Xue Lingsu and passed away that evening. The rest of the party remained on Mount Hai'an expecting an ambush from the Emperor's men. They waited for two days and saw no sign of Ming or Lingsu. King grew impatient as the wine was running low, so they set off for Buak on their own. They arrived in the aftermath of last sessions events and were given a small cave home for shelter by the chief. They stayed there the night. During their sleep they dreamed that they were attacked by a court official who was trying to sacrifice a child on the cliffside. When they tried to stop him, he splintered into six equal foes and a massive melee ensued. They eventually destroyed him and awoke to find Min and Lingsu had followed their trail and joined them in Buak. The party discussed their options. They wanted to learn more about the General and about Yue Guang. White Qirin had given Lingsu a letter he'd received from a man by that name, who he new to be close to the General. Yew Guang told him about another half of the prophecy revealed to him in secret by the General. It instructed Yue Guang to prepare a tomb beneath the Ogre Gate Inn and prepare a special elixir with the General's blood. He claimed this would awaken his memories when he was reborn. However Lingsu was suspicious of this letter and wanted to look into the matter further. Long Shu, who has family in Hai'an, felt he may be able to contact them and find out more. He had been exiled from Hai'an following an incident at the palace and most of his kin were in hiding, living under assumed names or exiled as well. Having heard rumors that his mother (Princess Yi) was in Huisheng he suggested the party go there. When they reached Huisheng, Long Shu found an uncle who told him that his mother was forced by the queen into service at the Butterfly Moon House. He told his uncle to speak with the proprietor, Madam Han about working out an arrangement to free his mother. When his uncle returned, he was bleeding and his eye had been plucked out. He said the answer was 'no'. Angered, Long Shu went to the Butterfly Moon House with members of his party and confronted Madame Han, which led to a brawl. 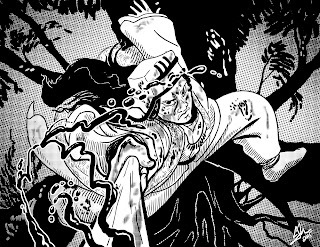 Lingsu hurled Madame Han through several partitions and Kang used his Dog Bashing Stick technique to wear her down, before Long Shu was able to press her to release his mother. Wounded terribly, she agreed and told the party to leave. Back at the Infinite Tea House, where Min and Zhizhu were watching Water Lily, they learned that she was spoiled and like to steal. The party left Hushing with Long Shu's mother and uncle for the Purple Cavern Sect Headquarters. There Lady Plum Blossom agreed to take in Shu's family. They also discussed other matters. She said she would tend to the meeting and tournament with Bronze Master while they went to Ogre Gate Inn to learn more about the elixir. Zhi Zhu decided to find One-Armed Fiery Demon, eventually meeting her outside Chen. She presented her with the head of Lady White Blade and learned Stealth of the Spider Demon. Then One-Armed Fiery Demon asked about rumors that her party being connected to a tournament for the Wind Saber of Sunan. Zhi Zhu stammered several times and it became clear she was being evasive. One-Armed Fiery Demon became furious and said their ties were severed. That next time they met, Zhi Zhu was her memory. After that she departed. The characters regrouped at Purple Cavern Headquarters and decided to pass through Huisheng again on their way north to Ogre Gate. Long Shu's mother revealed that Yue Guang had a house there and they wanted to investigate. At Yue Guang house, they met Guan's son. He basically confirmed the story of his father's letter, after some coaxing. However Zhi Zhu decided to sneak back into the house after they left and eavesdrop. Her heard the son speaking with a woman (Guang's daughter) and it became clear that they had tricked the PCs. When Zhi Zhu told Long Shu, the group return and fought with the two siblings. They got the upper hand and were able to force the son to reveal a secret chamber below the garden where his father had kept orders from the Glorious Emperor. Yue Guang was apparently an agent of the Empire. Among the orders they found confirmation that the letter was a trick designed to 'demonize' the child of the calamity star using sorcery. This is where the session ended.